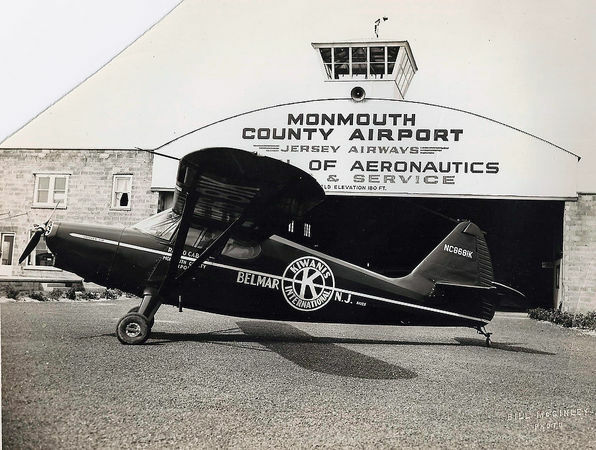 Spread out over 850 acres in Wall Township NJ, Monmouth Executive Airport is one of the last and largest bastions of private aviation left in the country. With its expansive rural setting and picturesque grounds, Monmouth Airport is one of the highest potential airports in the greater NY area. Back in 1938, the country was coming out of the grips of the great depression and concerns about war with Germany were rising. It is against this backdrop that self taught aviation enthusiast and iconoclast Ed Brown aquired the original tract of 700 acres from the widow of newspaper columnist and real estate investor Arthur Brisbane. Ed cleared the land himself, allegedly towing a section of steel railroad track behind a World War I army tank loaned to him by the American Legion. After serving as a Navy pilot in World War II, Ed returned to run the growing airport. Over time the airport became the extension of the Brown family’s homespun vision of family aviation. Sporting at one time a drive-in/fly-in movie theater and a child’s amusement park with a Train Ride, businesses both aviation related and not, took up residence at the airfield. The airport also housed skydiving companies and the infamous banner towing fleet that flew their ads up and down the Jersey Shore during the summer owing to the Airport’s easy proximity to the most popular Jersey shore points. Over its history Monmouth Airport has seen its share of VIP activity. It has served as a stopping point for presidents, vice presidents, movie stars, and famous bands, artists, and musicians. Jersey native Bruce Springsteen actually used one of the hangars for secret rehearsals with the E-Street Band and regularly flies in and out of the airport as it is only 15 minutes from his home town of Asbury Park. As years went on Ed Brown continued his acrimonious relationship with town and county officials, at one time offering to sell them the airport, then reneging when they missed his stated deadline by a few weeks. Some have said that Ed never felt as alive as when he was fighting with the township government over something. Regardless, Ed’s iconic life was centered around the airport he created and remains forever, his legacy. Ed Brown passed in 2006, and in 2013 a consortium known as Wall Aviation finally was able to purchase the airport from the Brown family. The consortium consists of many investors who are also airport executives, aviation enthusiasts, and private pilots in their own rite. Working quickly to repair and resolve years of neglect the consortium has plans to bring the Airport finally into the 21st century as a modern Jetport. The team at Monmouth Executive Airport (KBLM) has a rich appreciation for its roots and relationship to the community. Together with State and Local governments, we’re excited to move into the future.